Marsh, James H.. "Jimmy McLarnin". The Canadian Encyclopedia, 18 January 2017, Historica Canada. https://www.thecanadianencyclopedia.ca/en/article/jimmy-mclarnin. Accessed 25 April 2019. James McLarnin, "Jimmy," boxer (b at Belfast, Ire 19 Dec 1907; d at Richland, Wash 28 Oct 2004). McLarnin moved into the welterweight division in 1932 and won the world title by knocking out Young Corbett III in the first round on May 29, 1933 in Los Angeles. James McLarnin, "Jimmy," boxer (b at Belfast, Ire 19 Dec 1907; d at Richland, Wash 28 Oct 2004). McLarnin was born near Belfast, Northern Ireland, the 5th child among 12. The family immigrated to Saskatchewan in 1910 and after one bitter winter moved to Vancouver. Jimmy was discovered and trained by Pop Foster, a longshoreman and former carnival fighter. 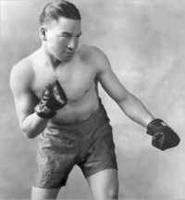 As a 16-year-old pro in 1923-24 he went undefeated in 19 bouts, including a victory over Fidel LaBarba, the flyweight gold medalist from the Paris Olympics. McLarnin abandoned the West Coast for Chicago and earned a title fight, which he lost at the Polo Grounds in New York. He won the world welterweight championship in Los Angeles on 29 May 1933 by knocking out "Young" Corbett III at 2:37 of the first round. McLarnin's fame spread as the "Irish Hero" and his name became as well known as his contemporary Babe Ruth. In three brutal fights against Barney Ross McLarnin lost the title in May 1934, won it back on 17 September of the same year, then lost it for good on 28 May 1935 - the last in front of a crowd of 40 000 at the Polo Grounds. McLarnin fought only three more times and retired, his winnings intact, in 1936 with a record of 63 wins (20 by knockout), 11 losses and 3 draws.